You never know when inspiration will strike, but with the Genesis1 from DigiTech you'll be ready. Because the Genesis1 gives you everything you need to create and capture truly original sounds wherever you are. With 11 amplifier models (including two GENETX models) and 11 cabinet models (including two GENETX cabinets), the Genesis 1 gives you the option to compose from standard models or genetically created combinations. For instance, the GENETX Gain amplifier is a combination of Rectified and High Gain amps, while the GENETX Crunch, is a combination of British Stack and Hot Rod amps. The two GENETX speaker cabinet selections feature the GENETX 4 X 12 - a combination of Vintage 4 X 12 and Boutique 4 X 12 cabinets, while the GENETX 2 X 12 is a combination of '57 Tweed 1 X 12 and Blonde 2 X 12 cabinets. 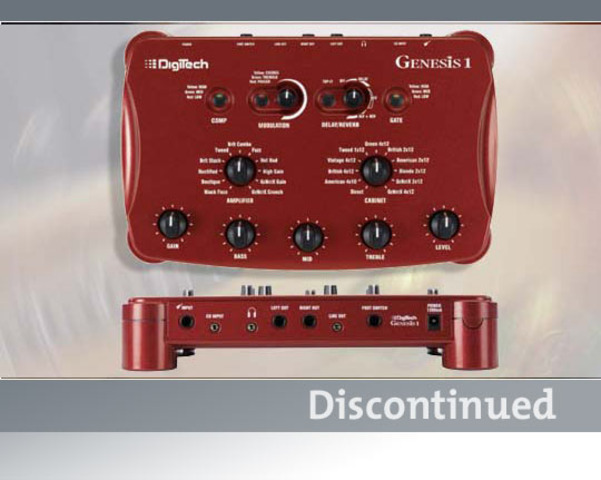 The Genesis1 also comes with seven studio quality effects and a line out for direct recording to your computer or favorite recording device. Add the optional FS 300 footswitch and the Genesis1 instantly becomes an invaluable performance piece for the stage. But regardless of where you use it, we're sure you'll agree that the most notable feature of the Genesis1 is its CD quality sound. The Genesis1 from DigiTech, it just might be the ultimate combination of performance and portability. Dimensions Width 10.5" x Depth 6.6" x Height 2.25"